Yet appearances can be deceiving. Somebody is trying to kill government liaison Reiko Gotoh, and it is up to werewolf bodyguard Akira and shapeshifting sheriff Hama Seiji to protect her. Seiji must look deep into his own past in order to uncover the hidden dangers that lurk in the present. The dark secrets he learns may not only affect his ill-fated romance with Gotoh, but could spell the end of the Vampire Bund itself! Dance in the Vampire Bund features stunning artwork and an enthrallingly original supernatural narrative. The manga has been adapted into a hit anime series in Japan and licensed by FUNimation for North America. 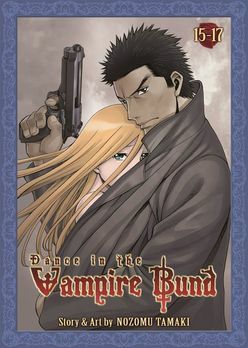 Dance in the Vampire Bund has repeatedly hit the New York Times Manga Bestsellers List with each new release. This omnibus edition contains the interlude series Dance in the Vampire Bund: The Memories of Sledgehammer volumes 1-3, which serves as a bridge between the first and second story arcs of the hit manga series Dance in the Vampire Bund.